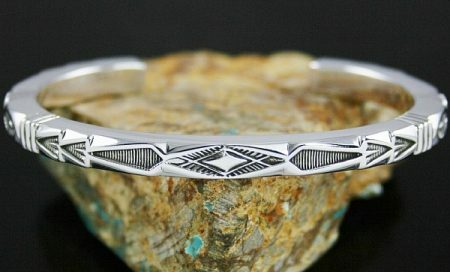 Navajo master jeweler Thomas Curtis hand made this fine bracelet out of heavy gauge sterling silver wire. The symmetry of the delicate yet deep stamp work is signature Thomas. 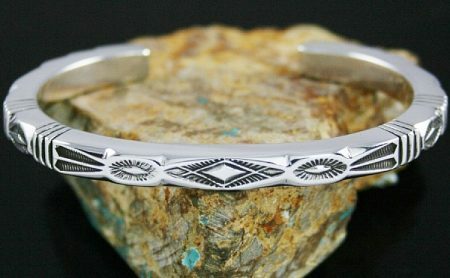 The bracelet has a perfect feel on the wrist and is eye-catching and elegant with intricate detail. This beautiful piece is one of his last creations prior to his untimely death in 2013. 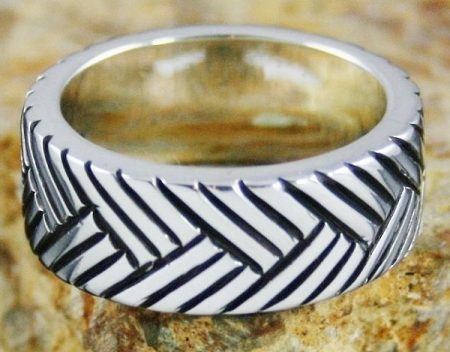 Master Navajo jeweler Thomas Curtis called this beautiful ring "tire tracks". The piece is cut out of heavy thick sterling silver and deeply stamped prior to filing. The detail of the ring is note worthy for the fine reverse stamping to create the complex interweaving design. This piece is among his last creations prior to his untimely death in 2013.